After the weakening of the Turkish lira against the dollar this week, and despite the government’s attempts to reassure them, the Turks still remain concerned about the economy, to one month’s elections critical. 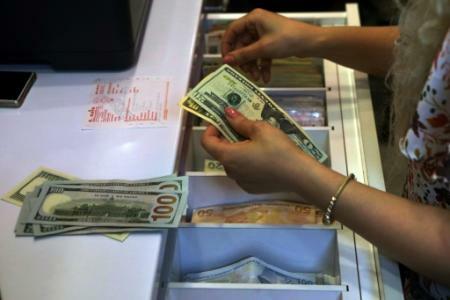 The Turkish lira has briefly exchanged to 4.92 TRY against a dollar but offset a portion of its losses Wednesday after a recovery unexpected from one of the main interest rates of the central bank. But for many, this measure is insufficient: showing no real sign of improvement, the pound was trading at 4.7 against a dollar at the end of Friday and lost 16% of its value against the greenback in a month. In a currency exchange located on one of the main shopping streets of Ankara, the minds are turned to the deteriorating situation and fear that the country does not go through what the economists of Commerzbank (DE:CBKG) has described this week as a “currency crisis”. An AFP journalist saw dozens of people pouring into this bureau of exchange to convert their pounds into gold, dollars, or euros. Ali Yilik, a seller of building materials come to change their books in dollar for his work, says he is not convinced by the comforting words of the authorities. “Who would not worry about (the situation of) the rate of exchange ? In normal circumstances, this does not happen. This is amazing,” he says. His son, Yahya Yilik, which manages the currency exchange Tunali Döviz, explains that more Turks are buying euros and dollars with the concern that the pound will fall further. “They think that the pound will continue to lose its value,” he reports to AFP, adding that the lifting of interest rates is only a “temporary measure”. Economists were calling for months for an adjustment of the interest rate to curb the double-digit inflation and an overheating of the economy, but president Recep Tayyip Erdogan continues to criticize this type of action, calling on the contrary to a decrease of these rates. The collapse of the pound in recent days has been caused by the comments of the Turkish president last week, saying that it wanted to weigh more on monetary policy he was re-elected on 24 June. Necdet Güven, a student come to buy dollars in anticipation of a trip to the United States, says he is “very concerned” about the economic situation. “Our economy is getting worse by the day. In the past, Turkey was a leading country in terms of agriculture and livestock, but now it imports meat from Serbia and hay from Russia,” he laments. In order to appease the spirits, the vice-Prime minister Mehmet Simsek, a former Merrill Lynch who has the confidence of the business community, said in a television interview that the central bank would do “whatever is necessary”. “There is no question of retreat, either on the independence of the central bank or on a regulated market economy”, he assured, on the private television channel NTV. Some, however, are convinced by the government’s rhetoric, which blames the fall of the pound in a “conspiracy” aimed at weakening Turkey. For Orhan Albayrak, a wholesaler, the increase of the value of the dollar and the euro is “artificial” caused by “the economic pressure of foreign powers”. “But in five or ten days of the election, I think that this increase will be reversed”, he hoped. After the announcement of the decision of the central bank on Wednesday, Mr. Erdogan stressed that Turkey would continue to adhere to the principles of international monetary policy.